The Sangean ATS-818CS is a quality digital world band radio with a built-in monaural cassette recorder. It has a charcoal gray colored plastic case. This dual-conversion receivers covers all shortwave frequencies (1.6 - 30 MHz) plus long wave (150-519 kHz), AM (520-1710 kHz) and FM (87.5-108 MHz) (stereo to headphone jack). A BFO clarifier control is included for smooth SSB (single sideband) and CW (Morse code) reception. This will allow you to listen to ham radio operators, plus some regular shortwave broadcast stations that are now also transmitting in SSB. A big LCD display with dial lamp shows: frequency (to 1 kHz on shortwave), 24 hour time, battery indicator and signal strength. The receiver features an RF gain, tone, external antenna jack (3.5mm), wide-narrow selectivity, keypad entry, manual tuning knob, plus 45 memories. 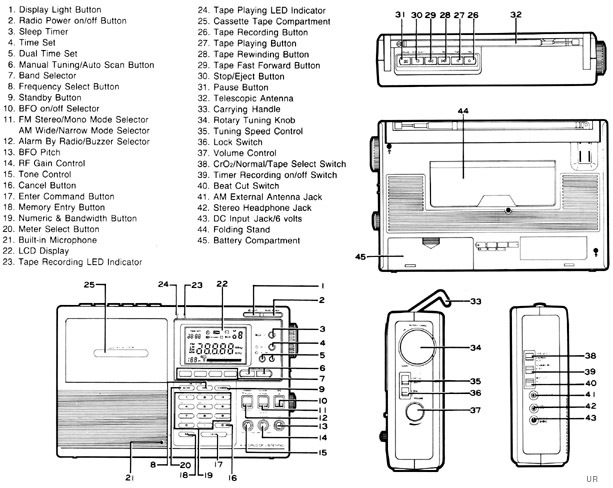 There is a 9/10 kHz MW (AM band) tuning step switch inside the battery compartment. Click here to view functions. The AC power adapter is included. This radio requires four D cells and three AA cells (not supplied). 11.3 x 7 x 2.5 inches (296x192x68mm 2 kg). One year limited warranty. 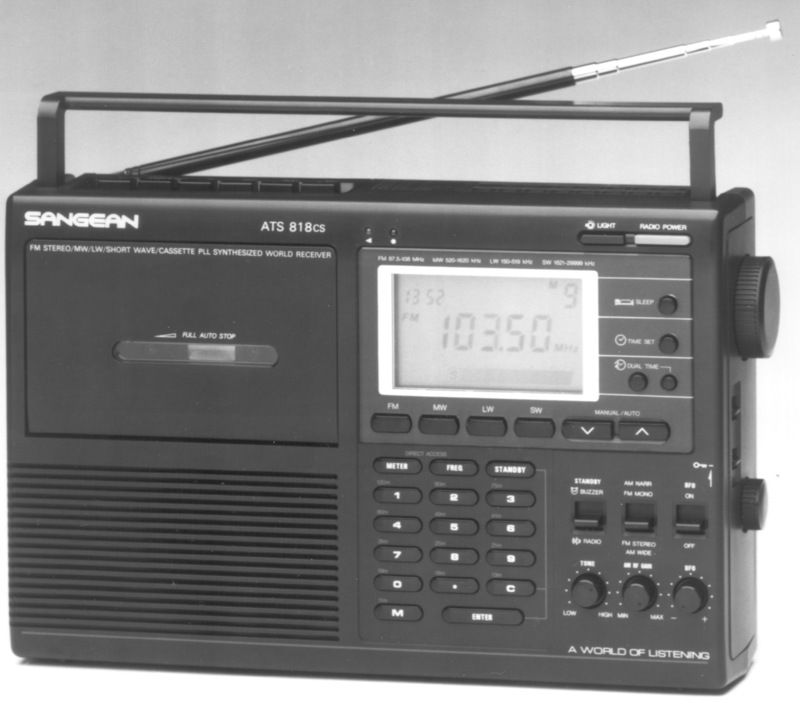 The later production Sangean ATS-818ACS was silver-titanium colored rather than gray and had 54 memories.